Owners of Kandao Technology’s QooCam 3D 180-degree camera can now capture 3D photos to share on Facebook. 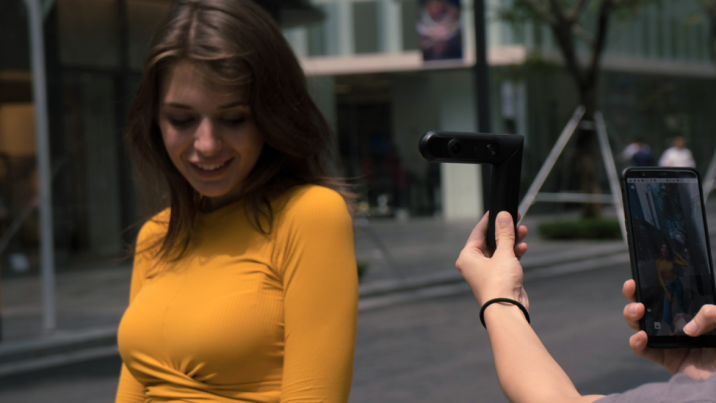 “[QooCam] is the first VR camera that offers a native way to post 3D photo to Facebook,” reads Kandao’s announcement about the feature. “Before that, only users who have an iPhone with dual-lens camera were able to create this effect.” However, even with the addition of QooCam capturing these photos, an iPhone with dual-lens camera is still required to share 3D photos to Facebook. Although this makes the feature significantly less valuable in the short-term, Kandao has said Facebook is adding support for more devices to upload 3D photos, so the camera’s capability could become much more valuable when that happens. For now, QooCam users can capture a 4K 3D 180-degree photo with the camera, use the app’s refocus tool to adjust the focus (which automatically generates a depth mapDigital data representing the distance of the objects in the scene from the camera. ), save the portrait to a dual-lens iPhone compatible with Facebook 3D photos (iPhone 7 Plus, 8 Plus, X, XS or XS Max), and publish the 3D photo to Facebook as you would any other 3D photo. You can read some tips for shooting 3D photos on Kandao’s blog post announcing this feature, including ideal distance from the subject, using refocus and contrast to get stronger depth effects, and capturing textured objects of a reasonable size. You can read the tips in detail here. For more information about the QooCam, visit Kandao’s website.